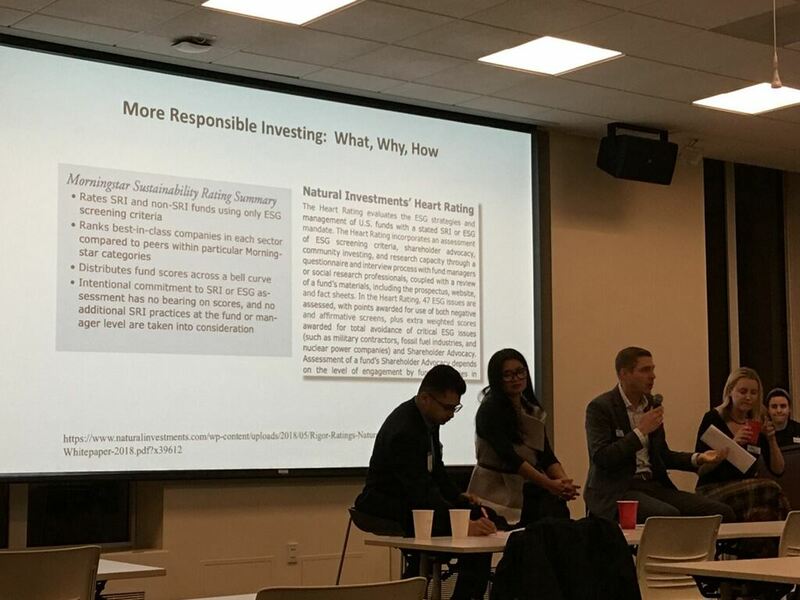 Over 20 people attended Net Impact Chicago's (NIC) November 2018 spirited interactive discussion on "More Responsible Investing" at Microsoft's downtown Chicago office. NIC's own Nurul Eusufzai moderated the panel. After networking fueled by pizza and beverages, and a warm welcome by Microsoft's Adam Hecktman, the panelists shared the nature of their credentials and how they became experts in responsible investing. Attendees learned the importance of first understanding one's values and preferences, and then ways to make potential investments that align better with their values than traditional default financial choices often do. Options like checking or saving with a local community bank or credit union, and community notes like Benefit Chicago with low initial minimum investments, are accessible to almost anyone. Those with more assets can use a knowledgeable financial advisor to navigate the world of stocks, bonds, and private investments. Responsible investment indices vary widely in methodology and quality, and the panelists advised caution in solely relying on such indices to indicate ethical and sustainable companies. Investments can 'exclude the bad themes' (like omitting fossil fuel or tobacco stocks for example), or 'promote the good themes', like financing renewable energy, women-inclusive companies, or organic agriculture. Current options for responsible investing within corporate-sponsored retirement plans are very limited, but could grow if employees demand such options. As always, investors need to consider their own life stage, assets, and risk tolerance in choosing investments of any kind. Thanks to venue host Microsoft, the panelists, NIC volunteers, and attendees for making this a great conversation. This concluded Net Impact Chicago 's successful 2018 series - a mix of social and content events. Please tune in to the NIC Events page for more coming up, including a Networking Happy Hour on January 31 and planned regular happenings in 2019. Contact us via <info@netimpactchicago.org> with suggestions, questions, or offers to volunteer or speak. Also, consider joining as a Chapter member to get the maximum out of the NIC experience in 2019!